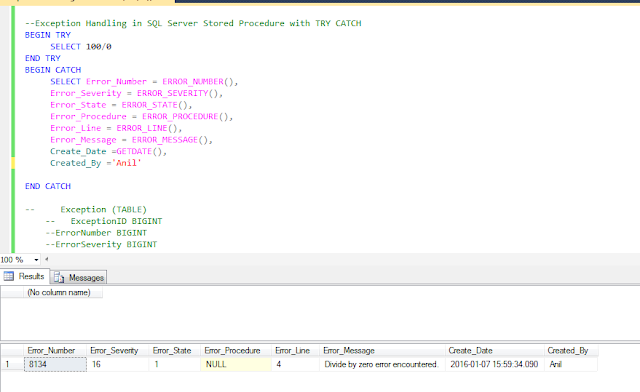 In SQL- Transact, The TRY CATCH are catches all errors and store in the @ERRORS variable and raise the errors using the RAISERROR(). 1. ERROR_NUMBER(): Will return error number. 2. ERROR_SEVERITY():Will return severity level. 3. ERROR_STATE():Will return state number. 4. ERROR_LINE():Will return error line number. 5. ERROR_PROCEDURE():Will return stored procedure name that occurred the error. 6. ERROR_MESSAGE():Will return full message text of the error.